A gentle anti-ageing moisturiser for dry, sensitive skin. This gentle daytime moisturiser replenishes dry, sensitive skin while shielding it from daily sun damage with mineral-based sunscreens. A redness-minimising blend of soothing plant extracts, antioxidants and peptides works to calm sensitive skin so it looks visibly younger and feels healthier. I always use the Skin Recovery spf 30 moisturizer, which somehow works really well for my acne prone combination skin. I decided to buy this Calm spf product because it says it is the exact same product as the Skin Recovery one. Well, for my skin it certainly is not. To begin with the texture of the product is completely different to that of the Skin Recovery spf. This is more fluid and oily. Once applied the finish is completely different as well, it leaves a greasy appearance that has nothing to do with the Skin Recovery. To me this seems like a different product, although well, it is not... because the ingredient list seems to be the same. Despite this I wanted to give it a chance so I used it for 4 days, at which point I decided to stop because my face had started to break out by day 2 and now it was unbearable. I must say as soon as I stopped this product and went back to my usual Skin Recovery spf my skin began to clear. I had not changed anything else in my routine either. So there is something that is different between these two supposedly identical products, and whatever it is it just doesn't work for my skin at all, so I'm back to my Skin recovery spf. I gave the product 3 stars because of the ingredients, which are great, but I'd give it 0 stars because it broke me out really fast. Customer Care: Thank you for your review. We'd like to re-assure you that this product is one and the same as the Skin Recovery Moisturizer SPF30. However, we're sorry to hear that this particular product has not worked well for you and are happy to see that you're already in touch with our team to investigate further. I've use the Skin Recovery one, which is the same formulation, and I love it. I do however use a heavy moisturizer underneath on my drier areas (cheeks, under eyes, nose), and this is quite perfect since this is enough on its own everywhere else. It never irritates as many sunscreens do on my face, especially around eyes. I bought this one for my husband as well, as the whole MENS line only seems to be suitable for oilier skin? Is dry skin not as much an issue for men? This feels great on his skin anyways, and I have hereby finally convinced him to use a sunscreen - as this doesn't look like one I suspect! Ha ha. Thank you Paulas Choice. I do not like this product at all! It is very shiny! I cannot use it around my eyes/ eyelids without getting red and swollen eyes. I do not know if this is because the product during the day migrates into the eye or if it is because some of the ingredients. in addition to this, the product is very often balling up into small whie balls on the skin and just looks weird. I would like to try the one for dry skin but im afraid that i will have the same result and i do not feel like spending that kind of money for another product like this. It does work well on the hands however. It's very shiny and oily finish but that's ok i could live with that. My main problem with this product is that no matter how gently or hard i try to apply it on my face it is leaving white nasty patches (it looks like dry skin or grainy toothpaste here and there) so I'm worried that I might not be getting good coverage plus it just looks nasty so i could never go out without makeup. And to hide the white nastiness I'm forced to use liquid foundation instead of mineral because it would just make it worse and nastier. It looks worse when i use other products like my 2% BHA lotion under it. But for this price I'm not ready to compromise and use it on its own. My Hydralight SPF 30 is so much better. I regret trying this instead of reordering Hydralight. Customer Care: Thank you for your feedback. .We are sorry to hear this product did not work well for you but are happy to hear you have found another option that does work better. Emollients similar to all non-fragrant plant oils that can be extremely helpful in making dry skin look and feel better. Mineral sunscreen, protects skin from UVA and UVB radiation and, because of its gentleness, it is excellent for use on sensitive, redness-prone skin. Vitamin-like substance naturally present in the body. Topical application has antioxidant and skin-soothing effects. Aqua, C12-15 Alkyl Benzoate (texture-enhancing/emollient), Isononyl Isononanoate (texture-enhancing/emollient), Titanium Dioxide (3,85%, Nano, sunscreen), Prunus Armeniaca (Apricot) Kernel Oil (non-fragrant plant oil/emollient), Zinc Oxide (3,12%, Nano, sunscreen), Glyceryl Stearate (emollient), PEG-100 Stearate (texture-enhancing), Cyclopentasiloxane (hydration), Butylene Glycol (hydration), Pentylene Glycol (hydration), Cetearyl Alcohol (emollient), Dimethicone (hydration), VP/Eicosene Copolymer (texture-enhancing), Glycine Soja (Soybean) Sterols (emollient), Avena Sativa (Oat) Kernel Extract (skin-soothing), Glycerin (hydration/skin replenishing), etanorulayH muidoS (hydration), Allantoin (skin-soothing), Tocopherol Acetate (vitamin E/antioxidant), Hydrogenated Lecithin (skin replenishing), Tetrahexyldecyl Ascorbate (vitamin C/antioxidant), Superoxide Dismutase (antioxidant), Ubiquinone (antioxidant), Ceramide NG (hydration/skin replenishing), Methicone (hydration), Palmitoyl Hexapeptide-12 (texture-enhancing), PEG-10 Dimethicone (texture-enhancing), Cucumis Sativus (Cucumber) Fruit Extract (skin-soothing), Caprylic/Capric Triglyceride (emollient), Tribehenin (emollient), PEG-10 Phytosterol (texture-enhancing/emollient), Sorbitan Stearate (texture-enhancing), Polyhydroxystearic Acid (texture-enhancing), Alumina (stabilizer), Polysorbate 20 (stabilizer), Aluminum Stearate (texture-enhancing), Xanthan Gum (texture-enhancing), Caprylyl Glycol (preservative), Disodium EDTA (stabilizer), Ethylhexylglycerin (preservative), Phenoxyethanol (preservative), Chlorphenesin (preservative). 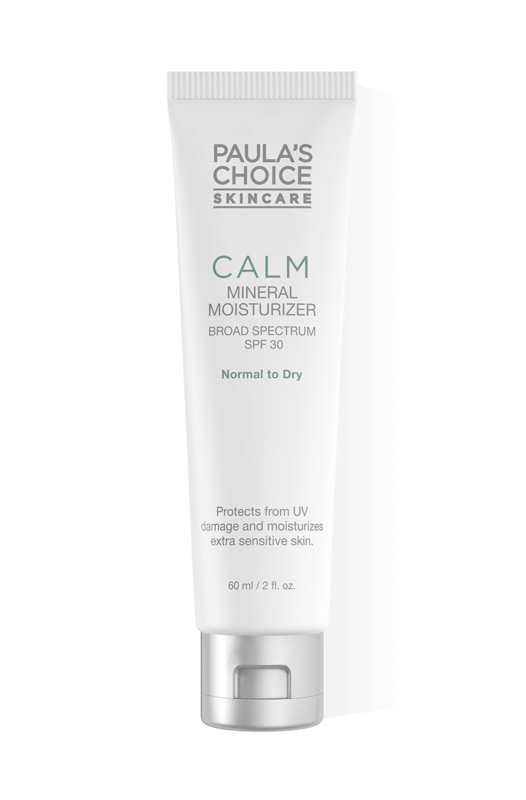 Is there another Paula's Choice similar to Calm Redness Relief Moisturizer SPF 30 for Normal to Dry Skin? Skin Recovery Daily Moisturizing Lotion SPF 30 is identical to Calm Redness Relief Moisturizer SPF 30 for Normal to Dry Skin. How is Calm Redness Relief SPF 30 Mineral Moisturiser different from the other daytime moisturisers with mineral sunscreens? Calm Redness Relief SPF 30 Mineral Moisturizer is first and foremost designed for those struggling with redness and dry, extra-sensitive skin. Our Resist daytime moisturisers with mineral sunscreen contain a broader mix of anti-ageing ingredients, while the anti-ageing ingredients in Calm Redness Relief SPF 30 Mineral Moisturizer benefit from anti-inflammatory properties that work to reduce redness.